Sprinkle meat with salt and pepper. Heat oil in a 5- to 6-qt. pan over high heat. Brown half the beef lightly, stirring occasionally, 3 to 6 minutes. With a slotted spoon, transfer meat to a plate. Repeat with remaining beef. Reduce heat to medium. Add minced garlic and ginger to pan and cook until softened, about 30 seconds. 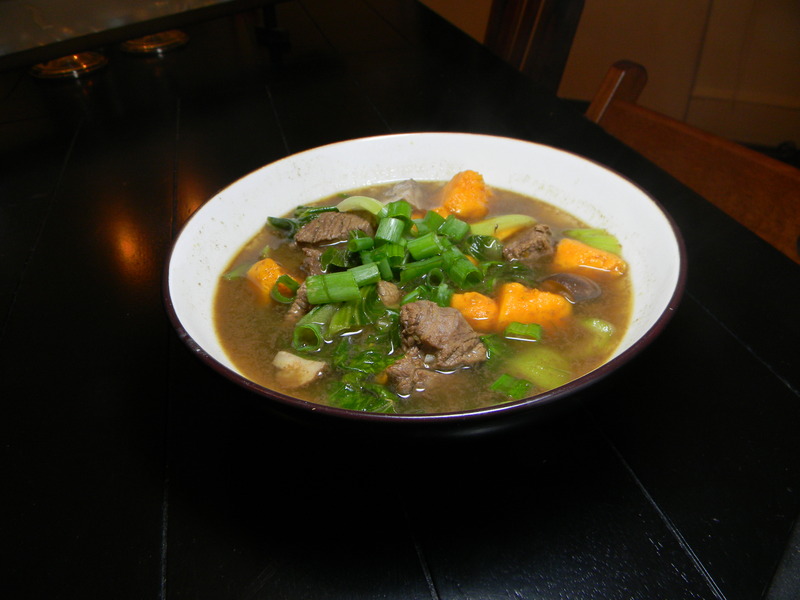 Stir in five-spice powder, then broth and soy sauce. Add sweet potato and beef to broth. Cover and bring to a boil over high heat, then reduce heat and simmer, with the pot covered, for 25 minutes. Meanwhile, trim ends from bok choy, rinse, separate leaves, and cut in wide diagonal slices. Stir bok choy into stew and simmer just until wilted, about 2 minutes. Cut onions in 3-in. slivers and add to the stew. Ladle stew into bowls and garnish with onions and ENJOY! *You may find this beef labeled as ‘Beef for Stew’ in your grocery store. The original recipe that we found calls for rib eye steaks, but we think this is a perfect opportunity to be frugal and let less expensive cuts of beef benefit from a long simmering in delicious flavors. **We got this recipe from this site and adapted it. I will definitely make your beef stew as soon as possible. My wife is Chinese and I love traditional chinese dishes. Bok Choy is a real favorite of mine. Anytime Bok Choy is prepared and presented to me, I assure you, there is never a piece left. Of course, I do respect the needs of my family and I do make sure there is sharing, however, I can assure you that there are not many occasions when Bok Choy is left. I really like your site and especially the Blogroll. A great resourse for your readers.Thank you for your hard work.